Jon Stone and Kristy Osmunson may seem familiar to you. They’ve both been in Nashville and have explored their options in country music before. Jon as a solo act, then a successful producer and songwriter (“Me and My Gang,” “A Woman Like You”) and Kristy as a founding member and sizzling fiddle player of the duo Bomshel. But what isn’t familiar is their music. That’s because no one—NO ONE—is making music like this. Click HERE to read more about American Young. Country duo American Young opened up about their latest single “Wasn’t Gonna Drink Tonight,” and they premiere their lyric video for the song exclusively on Digital Journal. 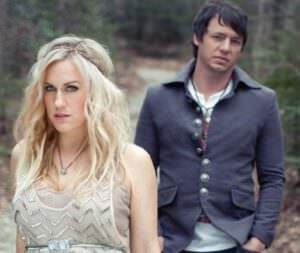 American Young is comprised of Kristy Osmunson and Jon Stone and they are signed to Curb Records. Their songs have been recorded by such artists as Kenny Chesney, Rascal Flatts, Blake Shelton and Lee Brice; moreover, their songs have appeared on albums that have exceeded five million in sales. “It’s amazing to be on Curb Records. Mike Curb is a really incredible human being and he has high standards for the music business, and Jon and I are the same type of people and we make music out of love,” Osmunson said. Click HERE to read the full story! Purchase their EP HERE. If the two faces in new duo American Young seem familiar to country fans, that shouldn’t come as a surprise. Kristy Osmunson was the founder and fiddle player for (the now defunct) Bomshel, while Jon Stone has had success as both a solo artist and a Nashville songwriter/producer who’s engineered hits for such names as Lee Brice and Rascal Flatts. When Stone met Osmunson, he actually did not have immediate intentions to return to performance, as he already had his plate full with songwriting and production work. However, a casual jam session made both realize that this was a musical pairing that had to be pursued. After playing their songs for colleagues and receiving glowing feedback, Stone decided to make the plunge back into life as a performing artist…and part of what promises to be one of the year’s most intriguing new duos.